My old mentor and senior coach, Beth, had some magic ways of teaching swimming. With butterfly it is all in the legs – get those right first before adding anything else. We’d then have, where space permitted, part of the lesson on mats around the side of the pool in order to demonstrate, run through and correct the arm stroke which swimmers new to butterfly invariably get wrong. For this session, for me, the emphasis is on the legs and the kick coming from the hips while introducing arms through skills, particularly single arm. At this level, in fact through all teaching grades, we have two goals: develop skills so that technique is perfected, try to improve stamina and strength, although this can only really be achieved by swimmers attending two or even three lessons a week. Tough clubs will have kids spending a good deal of time kicking up and down the pool on the basis that getting leg strength first delivers body position later; this is a recipe surely for putting kids off? It’s all I remember from the first couple of years when I went to a swim school, kicking back and forth across widths: whilst it did the trick with me when I was five or six, it put many off swimming. Today I started with streamlining against the side of the pool – before they got wet. I ran through streamlined position, and then the way in which the fly kick starts by pushing the hips back and forth. Some feel awkward, some have a laugh. Repeat this once in the water where they should feel less self-conscious. It is such an easy thing for the kids to get right: pushing off and gliding in a streamlined position even at Grade 4; it is also a pleasure to see several of them getting into this habit early and still doing it years later. It pays dividends for all strokes with body position, with dives and turns. It also ties directly into drills and exercises moving a competitive dive and at higher grades improving the dive and all important transition. After this rough programme for our Grades 4 and 5 swimmers (ages 9-11, one or two years swimming) I make suggestions for a group of G8 swimmers, typically our more advances 12-13 year olds. (Sense says a laminated print out. I am happy to show black and white images on a Kindle, especially my old Kindle. Not waterproof, but not too great a loss if it ended up in the pool. I am guided, as always, by Rubin Guzman’s brilliant ‘Swim Drills Book’. FC x 50m or 100m depending on the grade. The less they splash, the smoother they swim; the smoother they swim, the more control they have. I use words like ‘smooth, slinky, silent swimming. Dolphin resting on lane rope. Kick with Woggle: with arms out, this is OK on the back. With G8 fly kick on your side, change arm every 25m. This worked very well at identifying how most still kick from the knees rather than through the entire body. I only did this with Grade 8 today, but on reflection would have done it with the other grades too as it is the clearest way to see that swimmers are still kicking from the knee, or not. I may even get a swimmer or two out of the water to walk the length of the pool checking out those who are getting it right and swimming like an eel, or a crocodile compared to those kicking only from the knee. A fun one ‘collecting mussels from the bottom of the pool’ – with a fly kick. Still oo tricky at this level, but getting a straight arm recovery is so important. IDEALLY you find a swimmer from a top group who can demonstrate this, occasionally a swimmer does it beautifully so you can show the others. Depending on the time left I will use the last minute or 30 seconds with a handstand, aiming at the streamlined position – again. So long legs and pointy toes. These swimmers are reaching the stage when they will move to a training group (a non-competitive teenage squad) with the younger stars at this level going into a competitive squad. They’ve typically been with the club for three years or so and should have all the skills in place. Despite this none can swim butterfly which suggests we’re still struggling to teach this. I don’t think how we teach it has everything to do with it, it’s more that case that the serious junior swimmer will be in the pool for lessons at least twice, sometimes three times a week. The changes to the above set were on the distances swam and the kinds of drills given. The warm up was 100m swims, the kick sets 2 x 50m. 8 kicks 1 pull: count 8 kicks with 9 the arms go in and 10 the arms recover. Fly Kick on the side swapping arm after 25m worked very well. In the space of six 25m lengths of this, walking along the side of the pool, I could spot immediately the problem and fix across the board. Pushing the bum forward and the bum back is just the start of this, then its a case of getting them to instigate the kick from the head or even the arms. Finally, putting the whole stroke together at the end I was delighted that one of them just about cracked butterfly, while all showed improvement. All they need is a second lesson this week on butterfly before they move onto a different stroke next week. The following is the first stage in thinking through the construction of a series of activities or learning object where thought has been given to improving access – in this case for swimmers and swim coaches. This collation of the materials in the desired chronology will be re-versioned on the Xerte platform that offers far greater versatility for the user to set adjustments to the way the material is presented to suit their individual needs. Fig.2. A leisure swimmer in the Pells Pool, Lewes. Illustration by Neil Gower. Figure one is an illustration by Neil Gower done in the style of the artist David Hockney showing a swimmer doing breaststroke hidden under the ripples of water in a swimming pool. Swimming breaststroke can tie you in knots – this is how to identify and fix problems. Secondly to help the swimmer become more efficient. The swimmer might be progressing from teaching to competitive swimming or they wish take part in a gala and realise they may have faults to address. Let’s start by taking a look at what we’re trying to achieve. Here’s breaststroke as it should be. Figure two shows in side video a graphic representation of a swimmer paused at that moment in breaststroke where they are about to kick the hands out into a glide. This is a still from an animation produced by BBC Sport. Repeated on a short loop this animation shows a figure swimming breaststroke. The stroke is correct in competitive terms with the hands pulling in front of the shoulders and the leg kick symmetrical. Other good practice is demonstrated – the body is horizontal in with the hips high, the head is steady and the chin tucked in – the breath in is short and explosive – the breath out underwater is a slow trickle. the arms reach forward out, pull out and scoop to the chest in one inverted heart-shape – in a symmetrical frog-kick the feet rise to the bum, the toes bend out and in a whipping action they press outwards against the water then come together in a streamline position with pointed toes. Figure three is a graphic a line drawing of a swimmer demonstrates in two columns, and – side ways on – two ways to swim breaststroke. In the first column we see a swimmer adopting the flat style of swimming competitive breaststroke. In the second column we see a swimmer adopting the wave style of competitive breaststroke. Looking at the first column we see that the flat style swimmer keeps his hips close to the surface at all times as he goes through the sequence of reach, pull, breathe, kick glide. Looking at the second column we see that the wave style swimmer drops his hips further – this will create a pronounced undulation in his swim. In each case the sequence shown ends with the swimmer in a fully extended stretch. The stretch is important in all competitive swimming, but particularly in breaststroke. Figure four is an underwater photograph of a swimmer overhead who is stretched out, their head tucked down, the hands clasped one over the other above their head – their legs stretched out behind them with the toes pointed. How would you describe this swimmer? The swimmer is stretched out horizontally on the water, head down, arms stretched out legs extended and toes pointed. This is the streamlined position. What metaphor might you use to you describe this position? Why is streamlining important in swimming? The streamlined position minimises resistance. As a teacher or coach observing a swimmer you will be familiar with the mnemonic – B.L.A.B.T. Do you remember what it stands for? Once your swimmers are warmed up, and ideally using a lane by the side of the pool – ask them to swim ‘their best breaststroke’. Walk along the pool observing them as they swim and register, using B.L.A.B.T, what they are doing. Keep your observations objective. Record what you see if you can or, as you see more swimmers in your group identify the key faults that they present so that you can then offer a sequence of progressive fixes and drills. What faults might you identify? Even at the elite end of swimming breaststroke can be improved, so what at the level that you are teaching are the common problems? What level are they in the scheme that you use? They are likely to be in a senior teaching group or in a competitive development group. Make a list of the faults you identified or think would be most common. Use B.L.A.B.T to ensure that you think about all aspects of what the swimmer is doing. The head tips back and forth rather than being steady, the chin tucked in as the shoulders rise from the water. The arms pull down to the hips rather than staying in front of the shoulders. The arm pull is broken into two or more parts rather than a continual action. The arm pulls out wide, rather than staying shoulder width. The hips are low in the water. The leg kick is not symmetrical and synchronised – one leg may be kicking later than the other, one may do a screw kick, there may be a short flutter kick or dolphin kick at the end of the stretch – all of these would result in disqualification in a competitive gala. The legs fail to come together in a streamlined position. Watching the feet and ankles do the toes pull in as they are raised to the backside then push and flex outwards, planta flexion, as they kick ending with pointed toes and the streamline position? The inhale and exhale take equally long instead of a short, explosive inhale and a long, trickle-like exhale when the head is underwater.The correct timing should result in a fluid, even dolphin-like ‘stitching’ through the water. This can only occur if there are distinct phases – pull, breathe, kick, glide. The simplest approach to isolating parts of the stroke to put in a fixing drill or exercise is known as ‘whole-part-whole’. This means, simply, that having seen the full stroke, you then concentrate on one part at a time, typically arms or legs, though sometimes it is possible to isolate the breathing and head position, or to look only at the ankles, for example, dipping your head underwater to blow out to teach ways to breathe or sitting on the side of the pool running through actions with the flexing of the foot. Sometimes with breaststroke if you plan to work with swimmers out of the water it may be best to do some drills before they get wet – for example if you wish to take them through the arm action or leg action and be able to stand or crouch next to them. 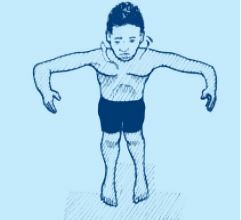 With due care and appropriate actions in relation to child protection issues, or simple manners before you touch an adult swimmer, the teacher may wish to physically put the swimmer’s arms or legs into the correct position and move the swimmer’s arms or legs through the correction motion. 7 Whole Stroke Drill To develope the glide in breaststroke. Table. 1. Six drills for breaststroke. Table one comprises four columns and six rows. Each row represents a logical sequence of drills for breaststroke, beginning with arms only drills, then leg only drills, then whole stroke drills. The second column in each case gives the purpose behind the drill. The third column offers some tips in relation to the drills – suggestions that can be made to the swimmer. The fourth and final column suggests that two minute should be spent on the first drill, while each subsequent drill is expressed as a repeated distance over the length of a 25m pool. Figure five is an illustration of a person standing upright in a water over their shoulders their hands together and reaching out in front of them, thumbs touching, palms down. Position your arms out in front of you. Thumbs touch, palms down and slightly out. FOCUS – Keep standing up straight. Sweep your hands outward until they are just beyond shoulder width and are an arm’s length apart. FOCUS – Take it slowly at first checking that everyone id getting it right – then speed up. Figure seven shows the same figure as in figures five and six, here he has dropped his forearm from the elbow – the palms are facing at an angle and into his body as if he is about to scoop the water up. Rotate the hands inward, begin to bend the elbows back and sweep you hands in drawing an equilateral triangle as your fingertips come together in front of your chest. FOCUS – Watch your hands – they should always been in front of your shoulders. Figure eight shows the same illustration of the person featured in figures five, six and seven with his fingers touching beneath his chest. Shoot the hands forward just below the surface. FOCUS – Pause in the starting position which equates with the glide in the swim. After the session take some notes and reflect on how it went. Run through the narrative – from the timeliness, preparedness and mood of the swimmers, their response to the individual activities, any feedback they gave and outcomes you observed. Think what went well and what did not. Bring any assessment sheets up to date regarding your swimmers in their grade. Add some thoughts on how you would do it differently next time. Think how you performed. Were you prepared and ready in good time. Were you able to respond flexibly to changing circumstances? How much time did you spend watching the swimmers compared to looking at a lesson plan? Were there any safety issues to consider? What was the tone of the session? Did any one swimmer struggle with how you put over the exercises and drills? Could you be seen and heard by all of them? Did they all understand what you meant? How were drills carried out? How many times did you have to repeat something before they got it right? What would you share with other teachers about the session you gave? What tips would you give? What resources would you suggest? Are their tools you would recommend using? How practical is this? Is there a cost involved? How might you put your ideas into a common knowledge pool to share with fellow teachers and coaches? How might you feed back to the swimmers and or their parents or guardians? Figure nine shows a graph on which the vertical axis shows velocity in meters per second. The base figure is zero point four meters per second while the highest figure is two point zero meters per second. The horizontal axis shows time in seconds, starting at zero and rising in increments of zero point two or two tenths of a second up to one second point to, or one second and two tenths. Across the top of the graph and covering its width there is an illustrative image of a swimmer doing breaststroke. The various actions of the strokes correspond to various points on the axis below to indicate at what point the stroke increases or decreases the velocity of the swimmer through the water. The competitive breaststroke swimmer knows that they are moving fastest through the water when they kick into the glide. This chart shows the velocity of a former world-record holder set against time shows the peaks and troughs of Silke Horner. Entering the stroke this chart shows how her velocity is at 1.4 meters per second as she enters the ‘catch’ when her hands begin to find purchase on the water, this drops as her arms reach out to 1.2 meters per second, rises as the arms scoop inwards to 1.5 meters per second, drops again as her arms begin to reach forward and the legs are drawn up to 1.2 meters per second, lifts a bit to 1.5 meters then drops right away to the slowest part of the cycle when her legs are tucked up creating resistance and her hands are reaching out to 0.8 meters per second – then, kicking into a streamline glide she accelerates to 1.6 meters. holding this glide for nearly half a second before repeating the cycle.